Key to consolidating and developing the southern Houndé Belt. Sarama’s 100% owned ThreeBee Project(1) is well positioned geologically and proximal to Teranga Gold’s Golden Hill Project and Sarama’s South Houndé Project. It is made up of the Djarkadougou, Bamako, Botoro and Bouni Properties, which together cover approximately 660km2 of highly prospective greenstone terrane. 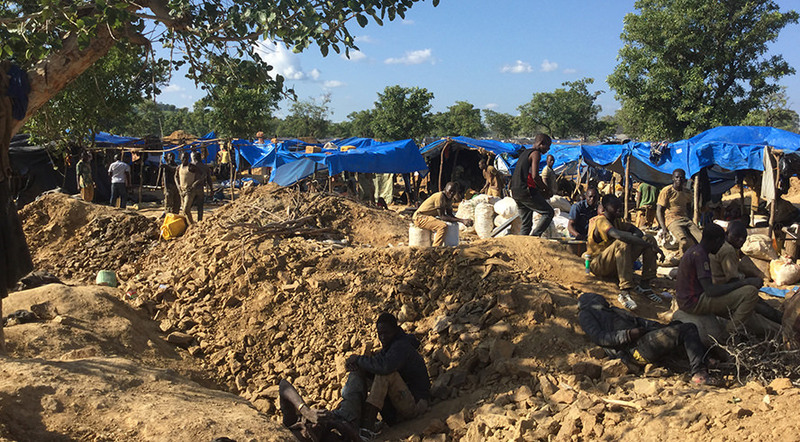 The addition of the Djarkadougou Property, which hosts the Bondi Deposit and Sarama’s recent discovery at the Zanawa Prospect, has added materially to the company’s footprint in the area and importantly, provides the company with visibility to mine development when combined with the South Houndé Project. It also provides scope to grow the resource base with re-targeting generating new discoveries in previously untested areas. The acquisition of the Bondi Deposit has dramatically opened up Sarama’s options and provided the company with visibility to the development of a low-capital, high-return mining operation. The Djarkadougou Property hosts the Bondi Deposit and Sarama’s recent Zanawa discovery. 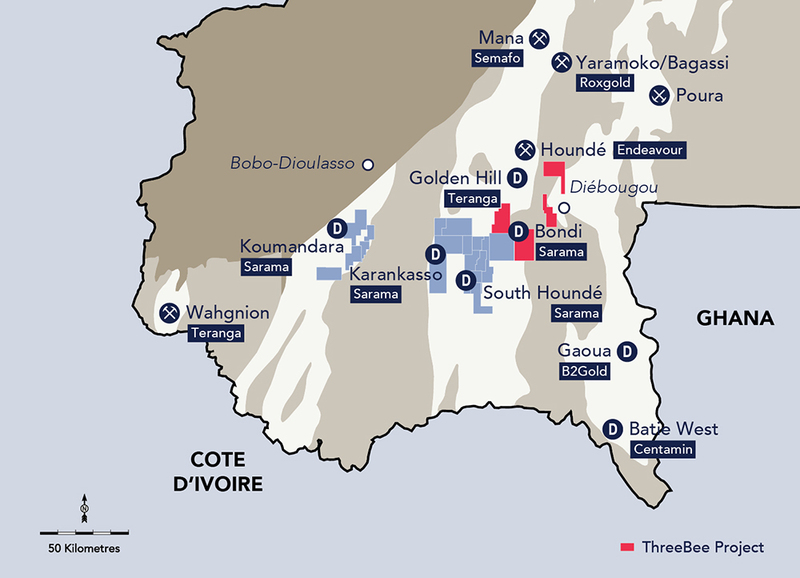 Sarama remains optimistic that it will grow the resource base on the Djarkadougou Property by extensions of the Bondi Deposit and regional discoveries, such as the Zanawa Prospect. The current resource base underwrites Sarama’s regional position and is within trucking distance of the South Houndé Project, providing significant optionality for the development of a mine in the region. Any growth in resource ounces will be highly accretive to Sarama on a NAV per share basis and further underwrite project development. The Bondi Deposit is well drilled and has a historical Mineral Resource estimate of 0.3 Moz Au (M&I) and 0.1 Moz Au (Inf)(2). The deposit is within trucking distance from the South Houndé Project and will deliver free-milling, high-margin ore feed with anticipated ROM grades of 2.5-3.0g/t Au and recoveries of 97% in oxide and 91% in fresh ore. 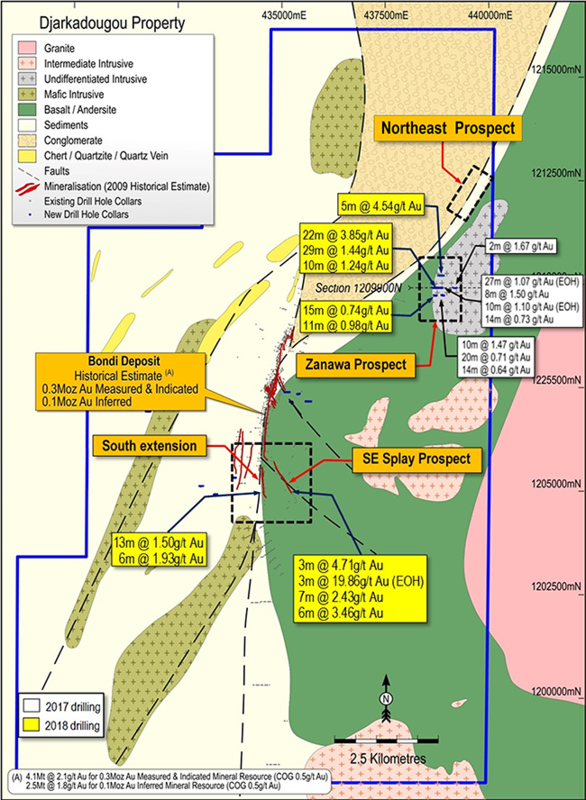 The deposit remains open in several directions and the company has been re-logging core and developing new targets with initial testing of the Bondi Deposit yielding encouraging results, including depth and strike extensions to the southern portion of resource zone and high-grade intercepts including 3m @ 19.9g/t Au (end of hole). The recent discovery of the Zanawa Prospect, situated 4km north-east of the Bondi Deposit, has opened up the exploration potential of the permit. 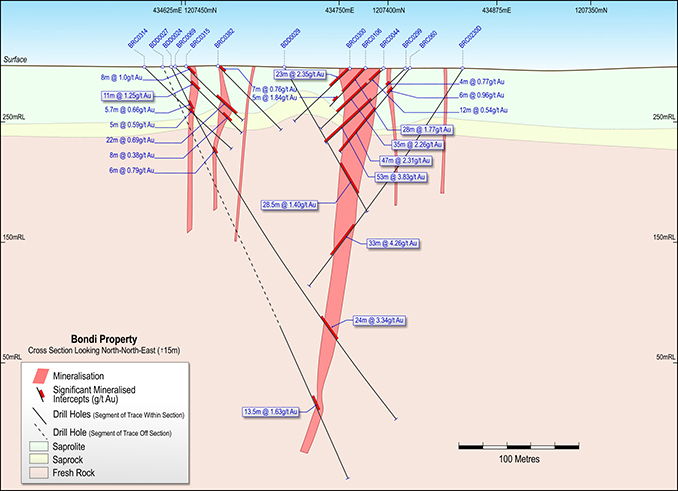 AC & RC drill highlights include encouraging near–surface results, including 22m @ 3.85g/t Au from 5m, 29m @ 1.44g/t Au from 1m and 5m @ 4.54g/t Au from 15m. Mineralisation extends over 1km of strike and is proximal to a volcanic-intrusive contact, and silica-pyrite-sericite-albite alteration is present. Additional geochemical and geophysical target zones located north to north-east from Zanawa remain untested and are a high-priority target area for follow-up work. This discovery is an exciting development for Sarama’s exploration team particularly given the geological setting is analogous to Teranga Gold’s nearby Golden Hill discovery. 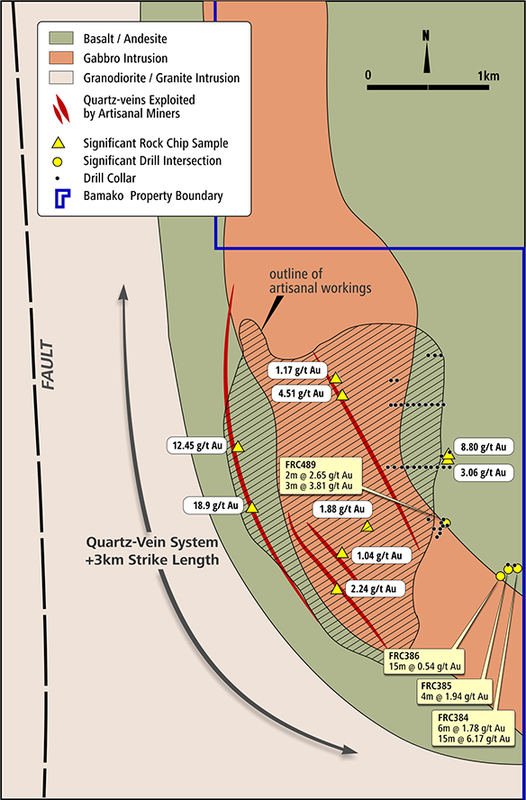 The Bamako Property is located approximately 20km east of the Bondi Deposit and hosts a high-grade quartz-vein system. The system is comprised of a series of anecdotally high-grade, stacked gold-quartz veins extending over 3km in length. These veins are delineated by significant artisanal workings and rock-chip sampling, which has returned multiple high-grade samples up to 18.9g/t Au and high-grade gold-in-soils up to 13.6g/t Au. Reconnaissance drilling undertaken by Sarama returned multiple high-grade intercepts including 15.0m @ 6.17g/t Au from 9.0m. Given the high-grade nature of mineralisation being encountered and the proximity of this property to Sarama’s main projects, this property adds further weight to the company’s regional development plans and has the potential to be highly accretive to any project development. The Botoro Property was acquired in May 2017 and is adjacent to the South Houndé Project and the Djarkadougou Property. 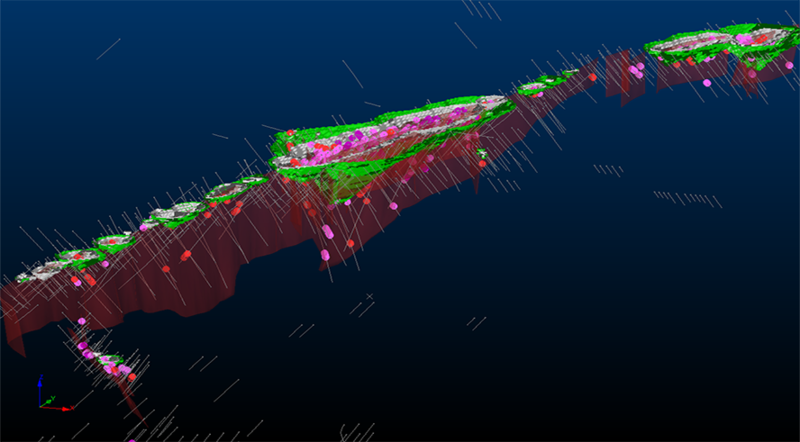 Initial reconnaissance work has generated encouraging first-pass exploration results including 4.4g/t Au in soils, km-scale anomalies and multiple drill targets. The property plays host to several different geological settings and is proximal to the Bondi Deposit, and shares many similar geological characteristics with the Djarkadougou Property. 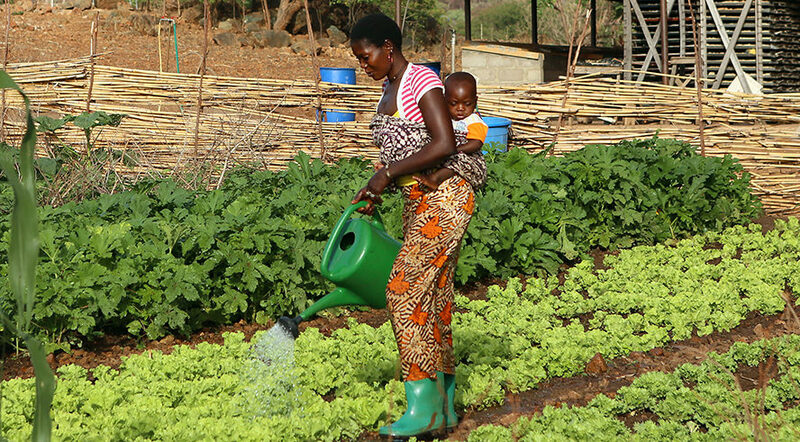 (1) The ThreeBee Project comprises the Djarkadougou, Botoro, Bamako(5) and Bouni(5) Properties and Sarama has, or is entitled to have, a 100% interest in each of the properties. The Djarkadougou, Bamako and Bouni Exploration Permits are going through a process with the government of Burkina Faso where it is required they be reissued as a new full-term exploration permit. The Company anticipates this to be completed in due course, though there can be no assurance that the process will be successfully completed on a timely basis, or at all. 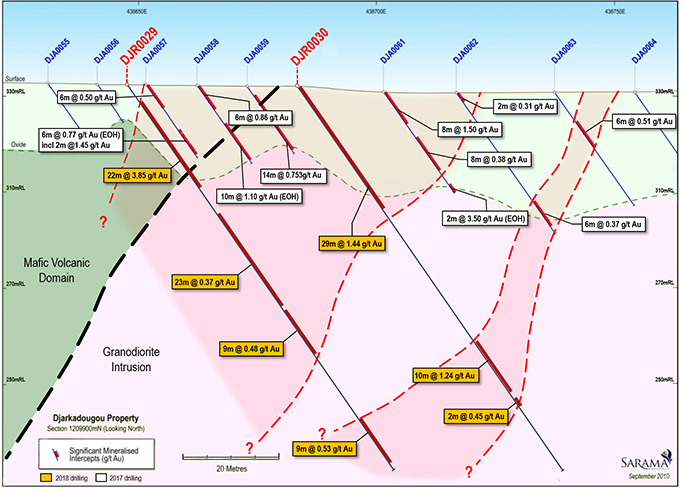 (2) Bondi Deposit – 4.1Mt @ 2.1g/t Au for 282,000oz Au (measured and indicated) 2. and 2.5Mt @ 1.8g/t Au for 149,700oz Au (inferred), reported at a 0.5 g/t Au cut-off. iii. The historical estimate was informed by 886 drillholes, assayed for gold by cyanidation methods, were used to interpret mineralised envelopes and geological zones over the area of the historical estimate. Gold grade interpolation was undertaken using IDÇ methodology based on input parameters derived from geostatistical and geological analyses assessments. Field measurements and geological logging of drillholes were used to determine weathering boundaries and bulk densities for modelled blocks.